The mountains are burning. The forests are parched. The hills and valleys are choked with smoke. There's no escape. The whole damn West is on fire. I find myself yearning for the crisp clear days of fall like never before. Praying for rain or snow or even a friendly wind to provide some relief from the relentless smoke. To clear our burning lungs and clouded thoughts. It's hard to breathe deep when you can't breathe deep, you know? So we have been spending lots of time indoors. Watching the last few weeks of summer fade slowly into the haze. Puttering around the kitchen and garden, canning and preserving. Trying to coax fall into an early arrival. There is something deeply grounding to me about putting up the summer harvest. Squirreling away a few jars for the colder days ahead. Connecting with our food and the changing seasons in a tangible, practical way. 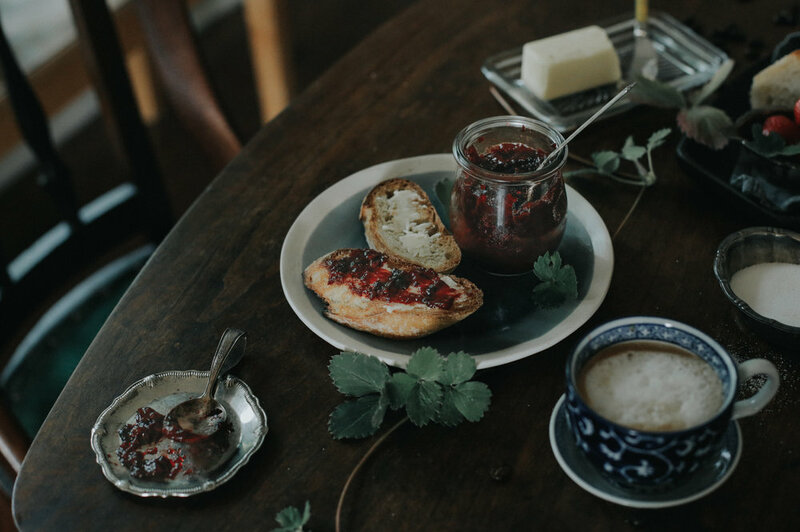 It's no surprise that jam was one of the first foods we, as humans, learned to preserve. Take some fruit, add honey or sugar, and you have a delicious preserve that lasts well beyond the growing season. A recipe for jam was even included in the earliest known cookbook, De Re Coquinaria (The Art of Cooking), written in the 1st century AD. It is rumored Joan of Arc ate quince jam for courage before battles, and that Mary Queen of Scots used marmalade to cure seasickness. Sailors ate jam rich with Vitamin C to prevent scurvy on long voyages. And during WWII, the Women's Institute put up over 1600 tons of jam to help combat food shortages. Jam has long been our friend in times of scarcity and uncertainty. A small comfort when winter is coming. So in the face of fires and floods, after I have called and donated and helped however I can, I make jam. If for no other reason than to carry on and lift morale. To remind myself of the quiet afternoon spent picking huckleberries under a clear sky not so long ago. To thank nature for her gifts even as we stand humbled by her power. Stay safe, dear ones. Sending all my love to you. Makes about four 8 oz jars. *I like Pomona's because it sets the jam using calcium instead of sugar. This allows for a much lower sugar jam. Low Sugar Pectin would also work just fine. If you choose to use that, follow instructions on that package to ensure jam sets well. 1. If using Pomona's pectin, mix the calcium powder with 1/2 cup water in a small jar. Shake vigorously. - Make sure your jars and lids have been cleaned and sterilized. 2. After cleaning fruit and hulling strawberries, crush strawberries and huckleberries in a medium bowl using a potato masher. You should have about 4 cups crushed fruit. Feel free to adjust ratio of strawberries to huckleberries to taste. 3. Measure 4 cups crushed fruit into large pan. Add lemon juice. 5. In a separate bowl, combine sugar and 2 teaspoons pectin powder. 7. Add sugar / pectin mix all at once. Simmer and stir vigorously for 3 mins to dissolve pectin and sugar. 8. Take the cold plate out of the freezer and spoon a small dollop of jam onto it. Let it sit for a few moments then gently run your finger through the puddle of jam. If it leaves a clean line through the jam, and it is begining to take on a gelatinous structure, it is done. If the jam runny and saucy, and your finger doesn't leave a clean line, simmer for a few more minutes and then repeat the test on another cold plate. The longer you cook the more "set" your jam will be. If you like a softer runnier jam cook for only 2-3 mins. If you like your jam to have more structure and gel, cook for a bit longer. I cooked mine for 5 mins and it came out just right. 9. Fill sterilized jars to within 1/2" of top. Screw on lids. Let cool in fridge and then move to freezer as soon as they are no longer warm to the touch. Keeps in freezer for 1 year. 10. Spread on good crusty bread with butter. Hibernate. I love how every full moon has a slightly different magic. A special energy. A unique personality derived from the sign and the season and the astrological climate. Tonight marks May's Full Moon. The Flower Moon, to be exact. A moon to honor the season of abundance and fertility and floral magic that is springtime. A moon that buzzes with growth and transformation. Marking the new and full moons with a small ritual has become one of my favorite ways to tap into the natural cycles. To reconnect to a time when we relied on the moon as our primary calendar. To a time when we lived by her seasons. The moon affects everything from female fertility to animal migrations, so it makes perfect sense that for much of human existence, tracking her progress across the heavens was an essential part of daily life. It's only been the past few centuries, with the advent of electric lights and 10-day forecasts, that we have started to move away these intrinsic cycles. And I have a sneaking suspicion we are missing her...our sister moon. That we feel her pulling on the tides of our bodies and yearn to mark her phases. To remember the old rituals. The forgotten songs embedded in our DNA. She control's the tides, after all, and what are we if not mostly water? So to honor tonight's lovely Flower Moon, I filled a basket with the first delicate pansies from the garden and whipped up a batch of these super simple shortbread cookies. The earl grey is subtle and earthy, while the lemon adds a cheerful brightness that feels like spring. And who doesn't love eating flowers? It always makes me feel extra goddessey. These little guys came together in about 30 mins and I pretty much made up the recipe as I went. Like I said, the primary goal here was eating flowers. Oh, and finding and excuse to use this sweet little vintage moon cookie cutter from my sister. Pansies are indeed edible, but make sure you are only harvesting where you know no nasty chemicals have been sprayed. A happy afternoon of flower foraging is an essential part of the process. So pour yourself a cup of tea and gather a few fresh blooms, sweet friends. Tonight's moon feels extra sparkly. Wishing you love and flowers and full moon blessings. 2. Using a mortar and pestle, crush the earl grey tea into a coarse powder. Finely chop the zest from half a lemon. 3. In a small bowl, combine 1/2 of the chopped lemon zest with the granulated sugar. Mix together until fragrant. 4. In a mixing bowl, beat together the remaining lemon zest, earl grey, butter, flour, powdered sugar, vanilla extract and salt until combined. 5. Keep beating and slowly add in the flour until the dough starts to come together. It will still be a bit crumbly, so add in the lemon juice until a fragrant dough is formed. 6. Form into a round of dough and wrap in plastic wrap. Chill in fridge for 30 mins to firm it up a bit. 7. On a lightly floured surface (you don't want to add too much flour if you can help it), roll out the dough to 1/4" thickness. Sprinkle the top of the dough with a bit of the lemon sugar you have set aside and lightly roll with the rolling pin to help it adhere. 8. Using a cookie cutter of your choice, cut out cookies and place on a parchment lined baking sheet. 9. Chill baking sheets with cookies in fridge for additional 10 mins to keep cookies from spreading. 1. While cookies are still barely warm, use a chopstick to make a little indentation in the center of each cookie. This will be used to help "sink" the back of the flower and help it lay flat. 2. Wash flowers and allow to air dry on a clean towel. 3. Allow cookies to cool completely. In a small bowl, mix 2 tsp meringue powder with 2 tsp water until a paste is formed. 4. Decorate cookies one at a time. Using a new clean paintbrush, paint the top of the cookie with the meringue paste. I like to put a little extra paste in the indentation to help secure the flower. Paint the back side of one pansy as well. 5. Using your fingers, gently press the back of the flower into the indentation, then delicately press each petal onto the cookie. 6. Sprinkle with a bit of lemon sugar for extra sparkle. The meringue paste will help it adhere. 7. Allow meringue paste to dry and enjoy! I have been thinking a lot about time lately. How we spend it. How we value it. How we never seem to have enough of it. We live in a culture that idolizes "busy" and pencils in happiness for a later date...for some fabled time in the distant future when the work is done and the bills are paid and the to-do lists have finally been conquered. It's so easy to forget that we are only allotted a few fleeting hours on this planet. That they will pass no matter how we choose to spend them. That time is a precious and non-renewable resource. Lately, I have been falling into the trap of "busy." Hook, line, and sinker. Days have been blurring into weeks, and weeks into months, and it isn't until a friend sincerely asks, "What's new?" that I realize I haven't been making time for any of the things that bring me joy. That I have nothing to say except, "Oh, you know...just working a lot." That I have been so caught up in the day-to-day grind, that I have forgotten to actually enjoy life. So for my birthday this year, I am promising myself the gift of time and committing to carving out a little space, each and every day, to live slowly and mindfully. To start manifesting the creative projects that have been rolling around in the quiet corners of my mind for the past few months. To make things by hand. To play. To plant. To make room for the quiet daily joys I so often rush past. And this means I'm going to need to get real cozy with the word "no" (something I have historically been terrible at.) I'm starting to realize that slow living is as much about saying "no" to things that don't serve you, as it is about saying "yes" to things that do. Prioritizing, lovelies. Cutting out what's not essential. Simplifying. Like Marie Kondo-ing your closet, but with your planner. So to mark my renewed commitment to slowing down and celebrate the first few glorious days of spring, I made a batch of these lovely Rose + Vanilla Bean Iced Lattes. Infusing the almond milk with whole vanilla bean and rose petals takes a little more time and a little more love, but really, don't all the best things? The end result is floral and creamy and refreshing and barely sweet. The perfect addition to a sunshiny morning spent lounging on the patio, ignoring your inbox. *Please note, like many of my recipes, the amounts here are merely suggestions. Feel free to adjust to your taste. Makes enough for 2. 1. Freeze cold brew coffee in ice cube tray to make coffee ice cubes. This will keep the ice from watering down your latte as it melts. 2. Add almond milk to a small pan. Using a sharp knife, cut vanilla bean length-wise to expose the tiny seeds inside. Scrape the inside flecks of vanilla bean into the pan of milk, then add the empty husks to the milk as well. Add rose petals. 4. Strain creamer into a clean jar or bowl to remove vanilla bean husks and rose petals. Those gorgeous little flecks of vanilla bean will stay in the creamer. Chill in fridge. 5. Add coffee ice cubes and fresh espresso shots (or cold brew coffee) to highball glass. Add creamer to taste. Garnish with crushed rose petals. I learned a deep love of tea from my mother. Growing up, every morning before school I was cheerfully greeted with a tiny steaming mug of English Breakfast and a thick slice of homemade pumpkin bread. It's her answer to just about every scenario. Bad day at work? Tea. Horrible breakup? Tea. Being audited by the IRS? Double tea. To this day, the first words out of my mother's mouth every morning are, "Let me make you a cup of tea." Before "good morning." Before "hello." Before anything - tea first. There's a woman who has her priorities straight. So it's no surprise that a cozy cuppa is my go-to when I am in need of a little comfort. I don't think I'm alone when I say these past few weeks have been...challenging. The political and meteorological climate, combined with a marathon of sunless grey days has left me feeling a bit lost. Untethered. Overwhelmed. Exhausted. Let's be honest - January is always a little brutal, but this year felt particularly rough. In life's more difficult seasons, it's especially important for us to double down on self-care. In order to show up for each other and the world, we first need to fill our own tanks and hold space for ourselves. Brewing a cup of soothing herbal tea is a wonderful exercise in daily self-care. I love the act of mixing the fragrant herbs, boiling the water, quietly meditating as it steeps. This simple ritual feels so grounding and restorative. A momentary time-out from the daily chaos. One of my favorite recipes for this time of year includes lemon balm and rose petals. The lemony flavor is bright and cheerful while the rose adds a lovely floral note and the smell of spring. Both have been long prescribed by folklore to lift the spirits and chase away the mid-winter blues. So let's all take a moment to slow down and breathe deep and drink some flowers. Here's to a brighter month ahead, dear ones. ***Disclaimer: I’m not a doctor, nurse, or licensed healthcare practitioner. Some herbs and botanicals are not safe for pregnant or nursing mothers and may not be suitable to take with certain medications or conditions. This information is not meant to diagnose, treat, cure, or prevent any disease. Always consult your doctor before beginning any kind of new vitamin, herbal, diet, or exercise regime. Make sure to research all of the ingredients to make sure they are safe for you and your family. 1. Loosely measure out all ingredients in a bowl. You can use a mortar and pestle to break up any large pieces if necessary. The ratios here are merely suggestions so feel free update according to taste. I would recommend experimenting with a few pots of tea to see what you like before mixing a large batch. 3. Use 1 tsp of the mixture per cup, or 2 - 3 tsp per pot of tea. Pour boiling water over strainer with tea and let steep for 3 minutes. I like to use this opportunity for a little mini-meditation. 4. Garnish with a slice of fresh lemon. Breathe, relax, enjoy. When I was a kid, I always had this strange sense of dread when it came to Sundays. Sundays meant piles of unfinished homework and lists of chores and early bedtimes. They meant the weekend was over and it was time to get back to reality. To responsibilities. To the daily grind. Sunday was just a nicer word for Monday. But the older I get, the more and more I appreciate the quiet productivity of a slow Sunday spent at home. Baking and cleaning and preparing for the week. Folding laundry. Making lists. Roasting chicken. Sharing space. I notice I tend to have a markedly more positive and productive week when I carve out the time to cleanse and nest and practice self care on Sundays. Slowing down for even a moment can feel like such a luxury these days. This Sunday I found myself trailing my fingers across endless rows of glass spice jars in my favorite little dusty corner of Missoula. If you are from around these parts, you know that Butterfly Herbs is a magical apothecary/teashop/bulk-spice oasis located in a turn-of-the-century pharmacy. Floor to ceiling bookshelves house enormous jars containing every herb, tea, and spice you can imagine. Oh, and did I mention they have a sliding library ladder used to access said herbs, teas and spices? Yeah, well...they do. It's the dreamiest and the loveliest and it's my happy place. After much meandering and much jar-smelling, I chose dried elderberries, echinacea, rose hips, calendula flowers, star anise and turmeric to add to my fall apothecary. A personal arsenal to fight off a lingering head cold. Oh, and a few scoops of my favorite loose leaf Irish Breakfast tea. Just for good measure. Elderberry syrup is one of the most effective herbal remedies I have ever personally experienced. I admit, I was very skeptical at first, but when I take a spoonful daily, I just do not get sick. Which is saying something, because I get sick a lot. And when I run out, like clockwork, I will come down with something within a week or two. This elixir is powerful stuff. To kick it up a notch for cold and flu season, I also threw in some dried rose hips (loaded with vitamin C and antioxidants), echinacea (immune boosting and antiviral), ginger (anti-inflammatory, antibacterial, antiviral, antioxidant), and cinnamon (anti-inflammatory and antioxidant.) Top it off with some local, raw honey and you have a cold and flu fighting powerhouse. Another immune booster I have been brewing this fall is this gorgeous Golden Turmeric Milk. You guys. This is the coziest, most soothing fall drink. Think foamy hot-spiced hug in a mug. And that color! Come on. Not to mention how wonderful it is for you. An ancient Ayurvedic remedy, Turmeric has been used to treat everything from inflammation and arthritis, to depression and even cancer. Combining Turmeric with black pepper greatly increases it's bioavailability, so be sure to include an extra dash of pepper just before drinking. So take a moment to slow down and reset. To brew up something warm and natural and soothing and seasonal. To prepare for the coming week and the coming season. To tend to the housekeeping of your space and mind and body. Happy Sunday. Have a lovely week, dear ones. 1. Bring water and all ingredients except honey to a boil in a small or medium sized pot. 2. As soon as the water boils, reduce heat to low and simmer covered for 45 mins. Stir occasionally to keep anything from sticking. 3. After 45 - 60 mins the mixture will have reduced by half. Remove pot from heat and let cool. 4. Use a mesh strainer to strain the juice from the berries into a clean bowl. You may want to use the back of a wooden spoon to really squeeze the liquid out from the mixture. Lining the strainer with cheesecloth can make cleanup a bit easier. 5. Transfer liquid to mason jar and mix in honey until combined. Keep in fridge. Take 1 TBS of this medicinal syrup every day to boost immune system. 1. Mix all ingredients in small saucepan over low heat. 2. Gently simmer, stirring constantly, until coconut oil has melted. Use a whisk to foam up the milk to make it nice and creamy. 3. Pour and serve. Garnish with a few grinds of black pepper, a dash of cinnamon, and a star anise. Do you feel it? There's a subtle shift in the quality of light. In the direction of the wind. In the early morning chill. Fall. She's coming for us, friends. And with her comes the promise of crisp air and wool slippers and thermoses upon thermoses of steaming tea. If I'm honest, I am looking forward to the change. To the cold. To the opportunity to turn my attention inward and set intentions and slow down. As a homebody, there are few things I love more than the idea of stockpiling the root cellar for a few months of cozy hibernation. Putting up the summer's harvest is a lovely way to mentally (and practically) prepare for the coming season. While I love the idea of flitting around the kitchen, canning every ounce of the garden's bounty, my crippling fear of botulism keeps my aspirations at bay. Dehydrating has become one of my favorite ways to preserve seasonal food without the fear of accidentally poisoning all my friends and family. That's what you call a win-win. Full disclosure: these tomatoes aren't actually "sun-dried." They are oven or dehydrator dried. But I promise they taste (almost) as good as if they were painstakingly turned for days under the mediterranean sun. And your kitchen will smell like a Tuscan delicatessen. So there's that. Note: This is really more of a suggestion than a recipe. No specific measurements are provided as it is one of those "season to taste" types of projects. Feel free to supplement and experiment with your favorite spices. 1. Cut the cherry tomatoes in halves or quarters depending on size. The larger the pieces, the longer they will take to dry. 2. Add the sliced tomatoes to a large bowl. Add enough olive oil to lightly coat all the tomatoes (usually about 1 TBS). Season to taste with salt, pepper, thyme and basil. I sometimes throw in a splash of balsamic vinegar as well. 3. If you don't have a food dehydrator, I can't recommend them enough. They are seriously my favorite kitchen tool. I purchased this one on Amazon a few years ago and we get a ton of use out of it for everything from kale chips and fruit leather, to dried herbs and oranges. This thing pays for itself in time and deliciousness. Dehydrator: Place the tomato slices skin down, cut side up on the drying racks of your dehydrator. Set the temperature to 140° F and leave to dry for 8 - 10 hours. Flip after about 6 hours. Texture is all a matter of preference, I like mine a bit crispier so I dry them for the full 10 hours. I would recommend checking in a few times until they reach your desired texture. They should be leathery and dry. Oven: Preheat the oven to 170° F or as low temp as it will go. Place the tomatoes on a parchment lined baking sheet and place in the oven, leaving the door propped open a few inches. Bake for 3 hours, then flip tomatoes. Continue to bake until they reach your desired texture (usually about 8 hours.) I would recommend checking in every hour near the end until they reach your desired texture. They should be leathery and dry. Note: I haven't used the oven method in years since we purchased our dehydrator. You may need to add or decrease baking time depending on the size of your tomatoes and your oven. It goes without saying, but always babysit the oven when it is on for extended periods like this. 4. Store in the fridge in an airtight container. Have a lovely week dear ones. There is a special kind of celestial magic in the air today. Not only is today the Summer Solstice, but it also just so happens to coincide with the full moon. The Strawberry Moon to be exact. The last time this happened was in 1967 - the summer of love. I don't know about you, but that just makes my heart go pitter-patter. I couldn't resist whipping up a quick batch of sun tea to honor the longest day of the year and absorb a little bit of this lovely cosmic energy raining down on us. I think I will let it continue to steep in the light of the full moon as well - just for good measure. Oh and it also helps if you make a flower crown and float around the yard in a linen kaftan. Trust me on this. Please note - this is really more of a suggestion than a recipe. You can use whatever you have to hand. A quick traipse through the garden, some loose leaf tea and a large jar are all you need. Add all ingredients into a large tea strainer. Fill the largest jar you have with clean water. Place tea strainer inside and let steep in direct sun for at least 5 hours, or until desired color is reached. Add ice and enjoy. There is something so endlessly satisfying about making something from scratch you once had to buy. It's what I love most about urban homesteading. That very particular kind of magic that comes with growing, creating and preserving your own food. Opening a fresh jar of garden tomatoes in the depths of winter or hanging bushels of herbs to dry in a warm attic. Baking your own bread. Picking berries for jam. It's a quiet beauty. A productive meditation of sorts. Investing a few moments of effort now as a lovely offering to your future self. These Moroccan-inspired Salted Preserved Lemons take a little foresight and a little patience. But I'm *hoping* they will be well worth the wait. Spring is in the air and I am already dreaming of using these beauties on fresh salmon fillets with dill and crisp summer salads from the garden. Preserved Lemons take about one month to cure, but only 15 minutes of real hands-on time to make. I recommend using the traditional Meyer lemons if you can find them. Meyers are thought to be a cross between a lemon and a mandarin, so they are a little sweeter and have a thinner, softer rind than your average lemon. I wish I could say these were each plucked lovingly from my own little Meyer lemon tree, but that would be a total lie. If I get two lemons a year from her, I chalk it up as a bountiful harvest. Oh well. I love her anyway. Oh, one last thing. It's really imperative to the process that you pretend you are on a sun-baked Mediterranean villa as you make these. A glass of mint tea is really helpful for this. Just a tip. 1. Wash and scrub the lemons thoroughly. Cut the ends off of each lemon. 2. Cut a lemon into quarters, but only about 3/4s of the way through. The quarters should still be connected by the stem end. Just cut far enough so that the lemon opens up a bit. 3. Add 1 tbs of salt to the bottom of your sterilized jar. Add 1 tsp of salt to the inside of the cut lemon and close it up again. 4. Push the salted lemon down firmly (cut side down) in the jar until the juices squish out. Cover with 1 tsp of salt. 5. I was able to get enough juice from squishing the lemons to totally cover them, which is the goal. If your lemon juice does not cover your lemons entirely, keep adding fresh lemon juice until it does. Anything that is sticking up out of the brine will likely get moldy. 6. Let sit at room temperature for 3 days, turning over several times a day. After that, refrigerate for an additional 3 - 4 weeks before eating. They can supposedly keep for up to six months in the fridge, but this is my first batch so I don't speak from experience. Many cultures don't even bother refrigerating, but I'm not much of a risk taker when it comes to food safety. 7. Before using, discard the pulp and wash excess salt off. It's the rind you want. Using a little bit of the juice can also great for brightening up a dish. Heres to springtime and little jars of sunshine. Have a great week everyone. I'll be the first to admit that, if a recipe takes longer than 40 minutes, I'm probably not going to tackle it. I'm an instant gratification baker. I like recipes that are quick and easy and rustic enough to hide my slapdash kitchen tendencies. I'm gonna warn you right from the get-go: This King Cake is not one of those recipes. It takes some time and some kneading and not one, but two rises. But it's Mardi Gras. And Valentines. And Chinese New Year! And if that isn't reason enough to bake a cake, I don't know what is. A King Cake is really more of a brioche than an actual "cake." A tea-ring / cinnamon roll of sorts with a sweet bready texture that makes it totally acceptable to eat for breakfast. Traditionally made only in the days between twelfth night and Mardi Gras, King Cakes have a ton of fun rituals and traditions associated. The baker hides a bean or a tiny plastic baby in the cake after baking, and whoever finds the baby in their slice is king or queen of the party. They then have to throw the next Mardi Gras party and procure the next King Cake. Everybody wins. This year, I made the traditional cinnamon sugar King Cake, as well as a braided strawberry cream cheese variation. My first time tackling my mother's tried and true recipe from when we lived in New Orleans. The smell of these baking in the oven instantly takes me back to stirring jambalaya on a stool in my Mom's kitchen. 1. Combine first four ingredients in a sauce pan. Heat until butter melts, stirring occasionally. Cool mixture to 105 - 115°F. 2. Dissolve yeast and 1 TBS sugar in warm water and let stand 5 - 10 mins. Add butter mixture, eggs and 2 cups flour. Beat at medium speed with electric mixer for 2 - 3 mins or until smooth. Gradually mix in enough remaining flour to make a soft dough. 3. Turn dough out on a floured surface and knead until smooth and elastic (10 - 15 mins.) Place in a well greased bowl, turning once to grease top. Cover and let rise in a warm place (about 85°) with no drafts for about an hour or until dough has doubled in size. 4. Punch dough down gently and divide into two equal parts. On a lightly floured surface, roll one portion out into a 28" x 10" rectangle. 5. Mix cinnamon and sugar in small bowl. Spread the softened butter over the dough, followed by the cinnamon sugar mixture. If you are using cream cheese and jam instead, spread a thin layer of each on your dough. Then roll the down (from the long side) jelly roll style, to create one long roll. Bring the ends of the roll together to form an oval. Repeat with second cake. Place on a greased cookie sheet. 6. Let rise again, covered in a warm area for about 30 mins. 7. Bake at 375° for 15 - 20 mins or until golden brown. 8. Optional: Let cool and ice with a simple powdered sugar icing. If you want to be super traditional, decorate with purple, gold and green sugar. Just shake a few drops of food coloring in a small mason jar with some sugar. Slip a plastic baby in from the bottom of the cake, so it's hidden within. * Note: I haven't included instructions for the braided version as I haven't quite perfected the technique yet. This attempt was a little uneven and lost some of the filling. Will update as soon as I nail it! The last few weeks have been a blur of meetings and deadlines and head colds and wedding planning in our little corner of the world. The days have been true to their January nature and unflinchingly grey. It's taking more and more resolve to get out of my warm blanket cocoon every morning and plod down the chilly steps to begin the day. Sometimes I lose the battle and end up bringing my work back to bed with me. Winter: 1, Hailey: 0. But when I must join the land of the living, I like to use the early hours to reset and indulge in a few moments of quiet self care. A steaming shower with eucalyptus oil, a foamy almond milk latte and this sweet, toasty granola do wonders for softening the blow and luring me out of bed on chilly days. This granola recipe is absurdly easy and can likely be made with what you already have in your cupboard. It's best served with plain greek yogurt, fresh fruit and cozy slippers. 1. Preheat oven to 325° F. Mix the oats, coconut chips, chopped nuts and salt in a large mixing bowl. 2. Over medium heat, mix the sugar, olive oil and maple syrup in a small saucepan. Stir constantly until the sugar is completely dissolved. 3. Pour the hot syrup mixture over the oat mixture and mix together until all dry ingredients are completely coated. You may want to use your hands to combine. 4. Spread the granola out evenly over a large, ungreased baking sheet. 5. Bake for 20 minutes. Toss and flip granola with a spatula. Return to oven and continue checking and flipping granola every five minutes until golden brown. Do not undercook, this granola is best nice and toasty. 6. Let cool and mix in dried cherries. Store at room temperature in airtight container. January is...formidable. For humans. For animals. For all living things really. We don't get enough sunlight. The days are grey. Our feet are cold. But there can also be something lovely about the quiet productivity of this first month. I personally find a lot of comfort in slipping back into my daily rhythms after the chaos of the holidays. Reading new books. Rearranging furniture. Trying recipes. Making plans. Folding laundry. I woke up the other morning with a need to bake. To do something with my hands that didn't involve a screen and get a little dough under my fingernails. This Cherry Almond biscotti recipe came to mind immediately. It's barely-sweet, with a crisp crumbly texture perfect for dunking in your morning coffee. They are great right out the oven, but just wait. They get even better in about 2 - 3 days. This is also one of those recipes that can be endlessly experimented with, which is my favorite kind. I think next time I will try pistachio cranberry. This recipe makes about 30 cookies so you will have plenty to share the love and run a quick batch to a friend or neighbor or colleague or mailman. A cozy little winter pick-me-up. 1. Preheat the oven to 350° and toast the almonds whole for 5 - 10 mins. Remove from oven and let cool. Chop almonds coarsely. 2. In a medium size bowl, stir together sugar, amaretto and melted butter until well combined. Stir in the almond extract and vanilla extract. 3. Stir in the eggs, chopped almonds and dried cherries. 4. Stir in the baking powder, flour and salt until well combined. Cover and chill in the fridge for 30 - 45 mins. 5. Remove the chilled dough and moisten hands to help make it more manageable (it will be a bit sticky.) Split the dough in half and make two 14 x 3" loafs on the baking sheet. Flatten the loaves so they have an even thickness all the way through. 6. Bake loaves at 350° for about 25 minutes or until golden brown. 7. Remove loaves from oven and let cool completely. Slice into 3/4" slices with a very sharp knife. 8. Place the biscottis back on a baking sheet and bake for an additional 25 minutes or until toasted. I like to flip them halfway through to make sure both sides get equally browned. Let cool. 9. Optional: Melt dark chocolate chips to dip biscottis in. You can just dip one end in, or if you are like me and are in it for the chocolate, dip one whole side in. Place on parchment paper and chill in the fridge until chocolate hardens. Keep biscottis on the counter in an airtight container.